With all the fast flowing rivers in these parts, Jet Boating in Queenstown is a must for anyone who likes a good rush. The Shotover and Kawarau Rivers have some great rapids, and the canyon scenery is unrivalled. There are several Queenstown Jet Boating operators, and all pilots spend more time zooming around the rivers, than they do at home, so you know you're in safe hands. A few of the Jet Boat operators depart every hour from the Main Pier. They'll shoot you across Lake Wakatipu and take in both the Kawarau and Shotover Rivers. 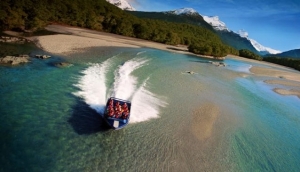 The Shotover Jet is the other big hitter in the world of Queenstown Jet Boating, and are regularly voted 'world's most exciting jet boat ride'. With 'combo' packages, you can combine a jet boat ride with other activities such as kayaking or wine tasting, so it's worth checking the latest 'combo offers'. Wanaka is another great option, taking passengers into the spectacular Mt Aspiring National Park.